The Minnesota Vikings defeated the San Francisco 49ers on Sunday afternoon, 24-16, during the NFL’s first full Sunday of action. This was a tough start to the season for 49ers quarterback Jimmy Garoppolo. He had some great throws, like his touchdown toss to rookie wideout Dante Pettis that showcased both his arm and his ability to extend plays. However, there were far too many misses or poor decisions. Garoppolo really struggled under pressure, throwing all three of his interceptions when under duress. His interception at the end of the game really summed up his play, as it was both a bad read to not account for All-Pro safety Harrison Smith and a poorly thrown ball. One of the reasons that Garoppolo struggled was that his offensive line was getting beat all game long. They couldn’t establish any real kind of run game, as the backs were constantly having to break tackles at or around the line of scrimmage. In the pass game, Garoppolo seemed to have a guy in his face almost every other dropback. He was only sacked once, but he was constantly having to move around in the pocket or take a hit because his line couldn’t keep the Vikings’ defenders off of him. Even star left tackle Joe Staley, the 49ers’ best lineman, really had a tough time and allowed multiple pressure and run stops. One of the standouts for the 49ers’ defense was Arik Armstead. He was able to make an impact on the edge in run defense and was moved inside and beat Mike Remmers with consistency. Armstead will have to lead the defensive unit that should be the strength of the 49ers’ defense this season. The 49ers got solid contributions from their long rangy outside cornerbacks, Richard Sherman and Ahkello Witherspoon. 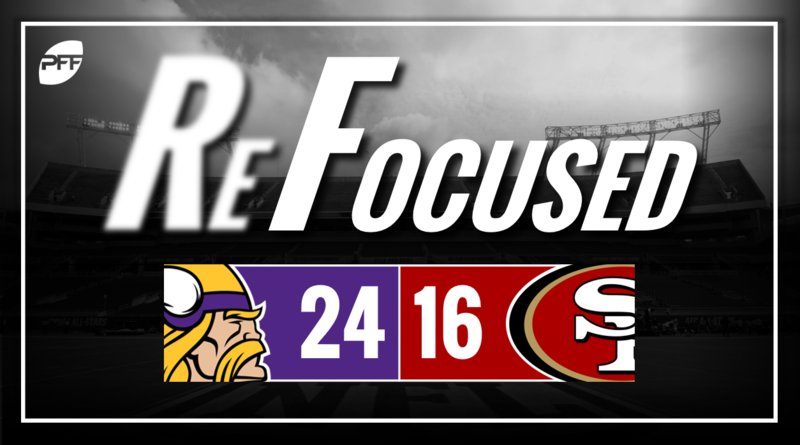 The one blemish on the day was the Stefon Diggs touchdown, but other than that the 49ers wide receivers had a limited impact. In his regular season debut as the Vikings starting quarterback, Kirk Cousins put together a solid performance to help his team get their first victory. His two highlights were his two touchdown throws to Diggs and Kyle Rudolph. The Diggs throw was his best of the day, beating 49ers’ Witherspoon over the top for a 22-yard touchdown. Cousins only had one turnover-worthy throw on the day, but the ball was dropped on the outside, causing no harm. In his first regular season game returning from a torn ACL, sophomore running back Dalvin Cook made a solid impact as a pass catcher. Cook caught all six of his targets for 55 yards but was unable to make too much of a difference on the ground, averaging only 2.6 yards per carry and fumbling the football once. The Vikings signed defensive interior Sheldon Richardson this offseason, and it paid off immediately. Richardson was downright unblockable in this game, constantly disrupting the 49ers’ offensive plans. He didn’t register a sack, but the way he was effortlessly throwing the 49ers’ guards out of his way and getting in Garoppolo’s face had a major impact on the passing game. He also constantly ruined rushing holes that the 49ers were trying to set up, forcing their backs to try to make something out of nothing (and usually failing to). It was an up-and-down showing for PFF Dwight Stephenson Award winner Harrison Smith at safety in this one. While he was as stellar as ever in the run game, he had some struggles in coverage. The Pettis touchdown was on him, as he got caught looking in the backfield and lost Pettis deep. He also was beaten on deep routes multiple times but the throws were missed. However, Smith made huge plays when they mattered most. His interception to seal the game was a fantastic play as he knew what Garoppolo wanted the entire time, but waited just long enough to make his move to ensure the ball was thrown. The Vikings’ defensive line was the most dominant unit in the game, putting Garoppolo under pressure consistently and being extremely disruptive in run defense. Richardson, Linval Joesph and Danielle Hunter were all standouts on the defensive front. While the Niners’ offensive line struggled mightily, the game ultimately came down to Garoppolo. He missed throws, made bad decisions and just couldn’t get enough going to put his team in a position to win this game.